Less iconic than Atlantic bluefin but more valuable as an industry, bigeye (Thunnus obesus)—one of several so-called tropical tunas—is prized for sashimi in Japan and canned for supermarket sales worldwide. It is not farmed. An internal report by 40-odd scientists working under the inter-governmental International Commission for the Conservation of Atlantic Tunas (ICCAT), finalised last week, shows that populations have fallen to less than 20 percent of their historic levels. Even more critical, the stock is barely half the size needed to support a "maximum sustainable yield"—the largest catch that can be taken without compromising long-term stability of the species. "The stock is in the red with a very high level of certainty," said Paulus Tak, a senior officer for the Pew Charitable Trusts, and an official observer at the ICCAT meeting in November that will renew or revise current bigeye quotas. Indeed, 18,000 runs of three distinct computer models returned an unprecedented 99.5 percent degree of certitude. "Bottom line, there are simply too many boats in the water chasing too few fish," Tak told AFP. A preparatory meeting of ICCAT's technical body in Madrid next week will likely validate the new assessment and formulate policy recommendations, including catch limits, for governments to consider in November. Japan and the European Union—which together account for half the 80,000 and 77,000 tonnes caught, respectively, last year and in 2016—will play a decisive role. "If they come to the table ready to hammer out a solution, they will be successful," said Tak. "But if they try to delay, or implement something that doesn't give bigeye a reasonable chance of recovery, it will continue to decline." That is what happened in 2015 after the previous head count, the first to show that the species was in trouble. Despite warnings then from in-house scientists, countries opted for catch levels that only gave the fish a coin's toss chance of recovering over a 10-year period. "Not only has the recovery not begun, the starting line has now been moved backwards so there is less time and more ground to cover," said Grantly Galland, a scientist at Pew's Global Tuna Conservation who took part in the ICCAT stock assessment. Some experts have calculated that cutting total catch to 50,000 tonnes per year would give bigeye a 70 percent probability of recovery by 2028. ICCAT, which struggles to balance commercial and conservation goals, has been here before. A decade ago, the industry—led by Spain, France and Japan—fished Atlantic eastern bluefin to the brink of collapse, triggering a motion at the UN body governing trade in endangered species to ban international trade outright. 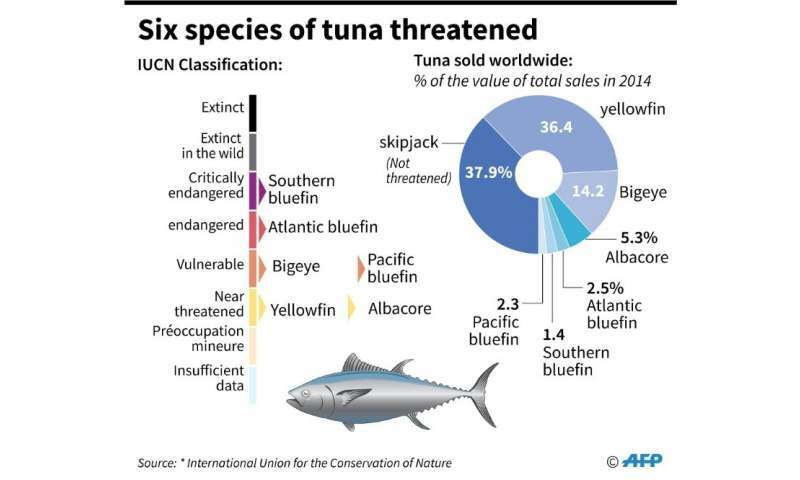 Classification of tuna species according to the IUCN and their worldwide sales. The motion failed, but jolted the industry into lowering quotas and cracking down on illegal fishing. Stocks recovered fairly quickly. 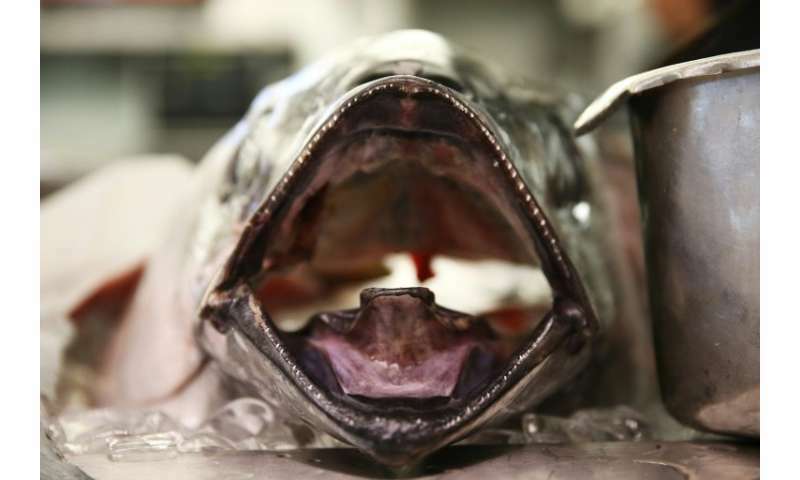 "This qualifies at ICCAT's biggest challenge since the bluefin crisis," said Tak. "It is obvious that urgent action will have to be taken." It would appear to be in the common interest of all bigeye fishing nations to protect the species, but proposals on the table favour some more than others. There are calls, for example, to rein in European vessels—mostly Spanish—that use enormous nets to scoop up hundreds of fish attracted by so-called FADs, or "fish aggregation devices". Traditional "one pole, one line" tuna fisheries in Portugal's Azores that have seen catches decline in five years from nearly 5,000 to 500 tonnes say these distant factory ships have indiscriminately harvested the juveniles that used to reach maturity in their waters. But curtailing these nets would give an advantage to Japanese and Taiwanese longliners, which trail fishing lines baited with hundreds, even thousands, of hooks. Currently, the global catch is roughly divided between the two. Also criticised is the legal practice of reflagging vessels from major fishing nations, especially Spain, to developing coastal countries that currently have no catch limit. This is the main reason the bigeye catch last year exceeded the allocated quotas by nearly 20 percent.